These Dice are machined from a special blend of polyester and acrylic resins that, when combined, have a slightly softer durometer that enhances the elastic nature inherent to these polymers. When rolled on a hard surface, the special blend of polyester and acrylic resins in these dice exhibit a unique double-bounce effect that we call “Second Wind”. When these dice land on a vertex (the point where the edges of the die come together) during the roll, it causes a temporary deformation at that vertex. The vertex then rebounds violently, tossing the die back in to the air with noticeable force. Polyester doesn’t just make for trick dice though. It has been in use since the 1940s, when DuPont purchased the rights from its inventors, Dickenson and Whitfield, and released the first polyester cloth. Later, this would lead to the wonder years of the leisure suit in the 1970s. Polyester doesn’t stop at being the choice fabric for a badly dressed decade, though. It’s a truly high-tech material used to create fire retardant racing suits, liquid crystal displays and holograms. 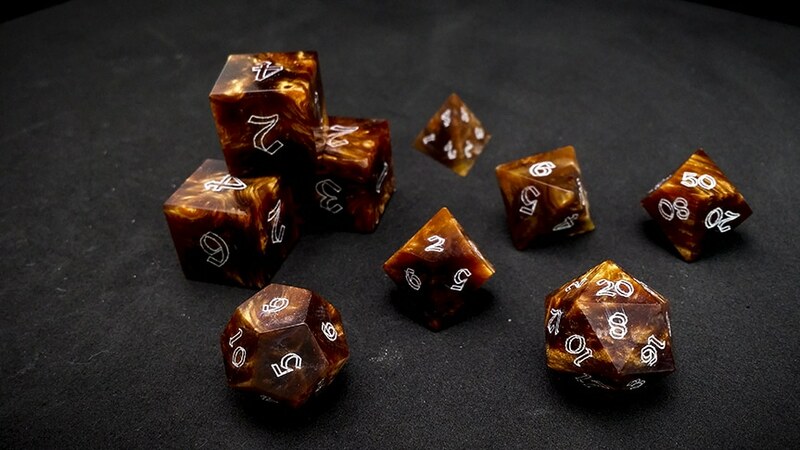 Another use of note to Artisan Dice fans is the use of polyester resin in the stabilization process our dyed burls and stabilized woods. Polyesters are polymers consisting of an ester functional group (an alkoxy acid like glycerol). The most common way polyesters are manufactured is through the use of a condensation reaction called azeotrope esterification, where two molecules are combined to form the ester base group with the addition of an oligomer (of a chain of monomers), along with a byproduct of alcohol called the condensate, which must be continually removed from the reaction with a desiccant. Like all of our Alchemist’s Dice, these dice have been machined from solid billets of material, and then each face is polished by hand in 6 progressive stages to give a luster and smoothness not seen in any other dice. After which the numbers are laser engraved one each face, then filled by hand with Titanium White so the results of your roll are more easily read.